Whether you are looking for a compact SUV that will comfortably fit the whole family or one that can haul your camping gear to the Ozarks and back, the Forester can do it all. This best-selling Subaru is also one of the best in its class for fuel efficiency, safety ratings and overall user satisfaction. As you're likely to see, many 2017 Subaru Forester reviews point out that the SUV also comes at an affordable price. 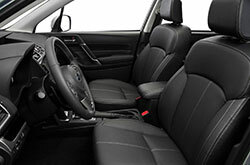 This model year, the Forester receives a few small updates to its appearance and connectivity and safety features. Read our comprehensive review below to find out if the Subaru Forester is right for you! The crisp, sporty body of the Forester is complemented by subtle new LED headlight and tail lamp accents, a refreshed hexagonal grille and sharper wheel designs. The cabin is simple, yet modern and features a built-in 7-inch touch screen. Subaru's STARLINK system is compatible with Bluetooth, several apps and, newly, iOS and Android smartphones. The spacious cabin has several comfort add-ons buyers won't want to miss out on. The panoramic moonroof is perfect for stargazing while a 10-way power driver's seat with 2 memory seat positions and reclining rear seats encourage relaxation. New this year is the All-Weather Package, perfect for Springfield winters. With a windshield deicer, heated side-mirrors and heated seats, users will easily navigate rough weather while staying toasty. The 2017 Subaru Forester in Springfield contains SUBARU BOXER technology that reduces engine vibrations and offers better balance to the body. 2.5i models are built with a 2.5-liter 4-cylinder engine capable of 170 horsepower. Standard, the engine is paired with a 6-speed manual transmission, but a CVT is an available option. 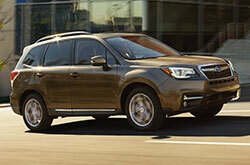 2.0XT models come equipped with a 2.0-liter turbocharged 4-cylinder engine that makes 250 horsepower. The turbocharged 4-cylinder is mated to a CVT, but with the Subaru Intelligent Drive system drivers can reprogram the transmission to mimic a 6- or 8-speed. Shift paddles also come standard on 2.0XT models. 2017 Subaru Forester reviews note that the manual gets the best mpg at an estimated 28 combined, while the others do quite well at 25 combined. All models in the lineup have all-wheel drive. An advanced collision response system, including seven airbags and an energy-absorbing high-strength steel frame, comes standard on all models of the 2017 Subaru Forester in Springfield. 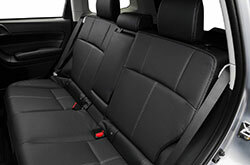 The symmetrical all-wheel drive and vehicle dynamics control increase the SUV's stability in adverse conditions. Higher grades come standard with the EyeSight Driver Assist system which utilizes a color camera with a large field of vision to monitor surrounding traffic. The system also includes smart cruise control, lane departure warning and automatic emergency braking. Blind spot detection with rear cross traffic alert and reverse automatic braking are also available on higher trim models. 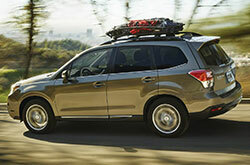 Is the Subaru Forester the Ideal Choice for You & Your Budget? Don't just examine the 2017 Hyundai Tucson, Mazda CX-5, Ford Escape, GMC Terrain and the Chevrolet Equinox when out browsing for new cars near Springfield; also be sure to take a lengthy look at the enticing 2017 Subaru Forester. The car's innovative features and winning design could wind up being just what you need from a daily driver. 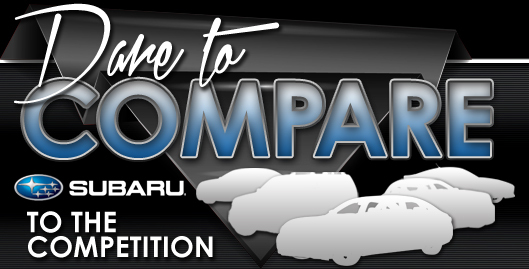 Look over our evaluation and check out the compare tool to see if the 2017 Subaru Forester is a match for your specific needs; and if so, check out finance incentives available at Reliable Subaru. 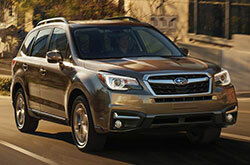 Want to see up-to-the-minute manufacturer incentives on the new Subaru Forester? Then remember to visit us - your resident Subaru auto retailer. Our thoroughly researched review makes it effortless for you to access the info you need, and we hope it offers a helping hand when it comes to making a good vehicle purchase. We have several Subaru Forester models for sale at Reliable Subaru in Springfield, MO; stop by to love a test drive - submitting a request for an appointment on our website is easy. Also, prior to your visit, you can see its stylish interior from all sides by viewing our video recording.